Selling on Amazon seems to be the easiest thing for anyone who wants to join the Ecommerce bandwagon without taking too many risks. As an Amazon seller, you just need a product, list it for sale on Amazon and sit back to get your first order and much more in due course of time. Pretty simple, easy and fun! No need to invest your efforts and resources in setting up your own website when you can enjoy the readymade traffic and brand reputation of Amazon. The profits that start coming in very short term with minimal effort on operations and logistics get you hooked to selling on Amazon. Things look hunky-dory in the short term. But, when you scratch beyond the surface you come to the harsh reality faced by many sellers who have been the victims of lopsided policies of popular multi vendor ecommerce marketplaces. The biggest flip side of selling on any marketplace like Amazon, eBay, Flipkart etc. is that their policies are made to lure the customers. You have absolutely no control and the customers can use these policies to give you bad rating which might result in getting a seller banned or penalized by sending reships and returns without their fault. The peril does not end here. You get a double whammy when other sellers on the marketplace copy your products and quote it marginally lower than your pricing. This is just the tip of the iceberg, there are a hundred other ways in which your product faces “the battle of survival”. To cut the long story short, you have to find ways to survive beyond the marketplace or be ready to face the doomsday without any warning! Why does every Amazon seller need to have an online store? Having your own store not only gives you something to fall back upon but also allows you to explore new business opportunities. An ecommerce store or a multi-seller website (whichever you choose to opt for) is a must-have safety net even if you are doing really well in the marketplace. When you are selling on the popular marketplaces like Amazon, you are just one of their thousands of vendors. Your brand sells because of the reputation of the marketplace and you struggle to find your unique identity. Customers don’t even miss you if your brand is replaced by some competitor selling the same products. By launching your own website, you can create your unique brand identity and have an existence beyond the marketplace. You can be the BOSS and define the products and policies to foster your business growth. Your identity is no longer limited to being an Amazon seller and you can advertise your brand prominently using various online and offline mediums. Having your own web store and mobile app give greater credibility and accessibility to your products thus making you popular and recognizable even in the marketplace. 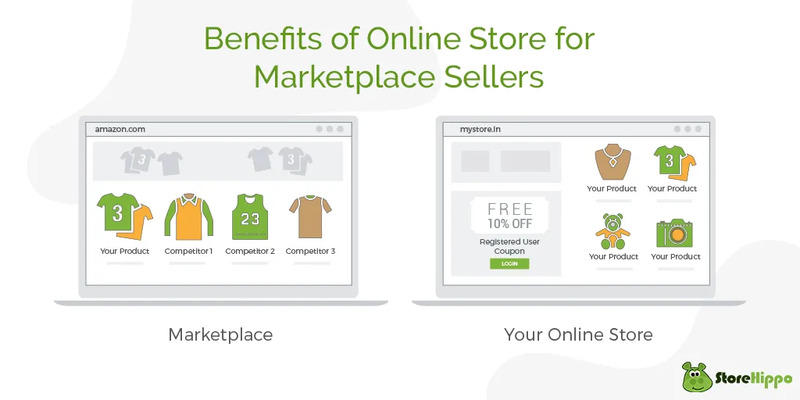 Selling on a popular marketplace brings the advantage of a readymade traffic and an opportunity to showcase your products to thousands of customers. However, despite selling really well you can never create a customer base on any of these marketplaces. The success of any business depends on creating a loyal customer base that keeps coming back for repeat orders. However, when you are selling on Amazon you cannot access the customer database and thus miss out on understanding the real potential of your market. When you have your own ecommerce store you can also have access to a lot of information about your customers. Based on this input you can plan and strategize your deals for higher conversions. Amazon and other similar marketplaces have their own marketing strategy that is not always attuned to the seller's interests. Many a time sellers are left with a large unsold stock if the marketplace decides to reduce the discounts on those products and promote some other products. When you create an online store you get the freedom to plan your own inventory based on the customer preferences or the products that are likely to bring more profit. You can stock products that can be bundled and sold together for better profit margin. Better inventory planning reduces the overall cost of operation substantially and brings in higher ROI. With your own store, you can always plan your inventory in advance and can align your marketing and deals with your stock. Amazon sellers cannot advertise or market their products outside of the marketplace. Hence, even if you have a premium product you have to list and compete with other sellers without being able to highlight the goodness of your product. On the other hand, if you have your own Ecommerce store you are free to explore the various advertising channels. You can advertise your brand in newspapers, magazines, local malls and can also use various paid campaigns to register a digital presence and recall value of your products and brand. You can also use a host of marketing tools like email marketing, push notifications, flash sales etc. to promote your products and brand. When you create your online store, you also benefit by getting the undivided customer attention when your products are not listed along with multiple other competitors vying for customer attention. You can showcase the USP of your product to make it popular among customers. Amazon and similar platforms limit your ability to offer personalized services to your customers. Also, you cannot sell many types of products on such multi-vendor ecommerce marketplaces. Having your own website gives you the freedom to explore and experiment with your products and services. You can cater to very specific audience segments, thus creating a niche market for yourself. You can also offer value-added services to your customers to ensure your customers choose you over your competitors. Additionally, with the access to customer details, you can plan a host of marketing mixes and experiment with them to arrive at the most beneficial offer for your business. Selling on Amazon is definitely a smart and cost-effective way of starting your business. However, to have a hold on the ecommerce market, every etailer should have a backup plan in form of an ecommerce website. While you keep earning good profits on Amazon or any other marketplace, take your business to next level by creating your own store that would last even if you have to quit such a platform. StoreHippo, top ecommerce platform offers easy solutions to create and launch online stores for a variety of B2B and B2C businesses. Create your 14-day free trial store right away and explore the goodness of the StoreHippo ecommerce platform.